Led by outstanding staff with many years of professional Industry experience the Drama Department provides an enjoyable, safe environment where the students are able to express themselves, develop their communication skills, explore issues in the world around them and improve their artistic talent. 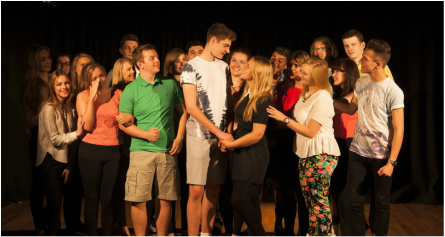 Teachers provide expert training in their specialisms which include Musical Theatre, Acting, Singing, Dance and Theatre in the Community. Extensive training is given to students who show a desire to work in the arts. The Drama Department work tirelessly to ensure they achieve their aim to ‘develop excellence in performance” We do this by providing wide-ranging, exciting and enjoyable range of activities both in structured lessons and in a full extra-curricular programme.